I have a cell array of 1x257 in which each cell array column contains different sized Mx1 array as shown in the screenshot. As you can see, each column in this cell array has different number or rows in it. 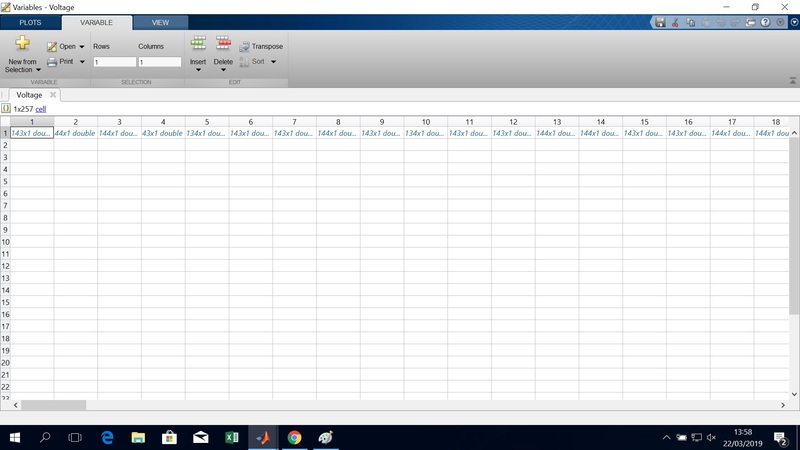 I need to convert this cell array named Voltage into a matrix with each column contains all the numerical data that is present in the correspoding cell array column. That means, the first cell array has 143 rows. So the column 1 of my new matrix has 143 rows. Similarly column 2 contains 44 rows etc. upto 257 columns. Is it even possible to form a table of different rows ? Advance gratitude for any help. Matrices have te same number of elements in all columns and rows, repsectively. This is the definition of a matrix. So you cannot store vectors of different lengths in a matrix. You can pad the vectors with NaNs, if this is sufficient for your problem. But storing a collection of vectors of different size in a cell array seems to be clear, clean and efficient.